Philips Lighting announced that its second-generation LED bulbs, replacing 75W and 100W incandescents, have been qualified by Energy Star, and may now sell for $10 to $15 after rebates. Even without utility rebates, Philips has worked with The Home Depot to offer new lower pricing: $19.97 for the Philips 15W LED (75W equivalent) and $24.97 for the Philips 19W A21 (100W equivalent). 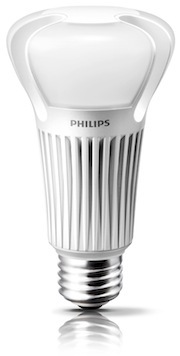 With over 90 ES-qualified LEDs, including the Philips 10W A19 (60W equivalent), the first LED bulb to achieve a price point below $5 after utility rebates, Philips offers the most affordable quality LED bulbs on the market. Philips calculates that if all 75W and 100W incandescent bulbs in US sockets were replaced by these energy-efficient LED bulbs, $8.5 billion in energy savings would result, and carbon emissions would decrease by an amount equivalent to taking 13 million cars off the roads. At the time of writing, only the Philips 40W and 60W bulbs are visible on the Home Depot site; the 75W and 100W won't be up until after February 18. I fearlessly predict that rather soon we will see an announcement out of Cree trumpeting that its 75W bulb has been ES qualified, and announcing a 100W bulb.